Nightingale-Conant says about The One Command: “It is a way that bypasses long, drawn-out, and often unsuccessful approaches to transformation and goes straight to the neurological and biological source of your actions and outcomes. It is a way that’s supported by years of scientific research and backed up by the real-life experiences of thousands of people (and counting). A way – a shockingly simple six-step process – that enables you to actually COMMAND your mind to instantly reveal to you the specific knowledge, information, and answers you seek. Personal and Business Success works on two levels; first you discover the power of your mind and next, through deep level theta instantly create an INNER CHANGE that increases serenity and security and more joyful living. You are directed in its application for real results in your personal and business success demonstrating the principles of Mastery at Your Command. Many thousands of happy “theta thinkers” have discovered success beyond their imagination; increased revenue, personal achievement and built successful business teams. Each one applied the theta state process realizing that the only thing holding them back was their limited ideas and fears about what they could or couldn’t do. By Commanding for new results each one rose to new heights – and so can you! In this 5 hour program you start with The One Decision that changes it all and continue with live action video of Asara taking business people though their unconscious limiting programs and activating their Success DNA instead and you complete the program with a bonus feature for Creating Your Future. Start your greatest success journey right now! HERE IS YOUR SPECIAL MONEY AND SUCCESS PACKAGE THAT WE RECOMMEND. All programs include exercises, handbooks/manuals and directed exercises to get the greatest benefit of the material. 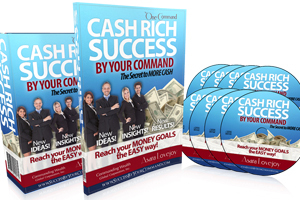 Our most popular One Command program ever is Asara’s transformational program on money and your Cash Rich Success. This the number one issue for many individuals – how to be financial free with peace of mind – and this program covers it all with additional exercises and guided MONEY COMMANDS THROUGHOUT! 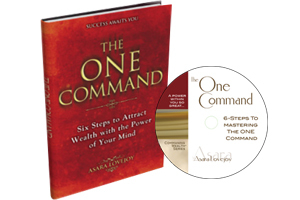 And our highly popular program, The One Command: Imprint Your DNA for Lasting Wealth and Happiness created with our Nightingale-Conant partner. 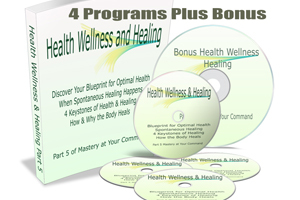 It is a beautiful hard copy 6 DVD set with handbook and exercises included. Plus add 5 hours of dedicated attention to your Personal and Business Success in our audio/video series. You can order each money and success item separately or take advantage of our MONEY AND SUCCESS bundle THAT GIVES YOU all 3 programs which means 2 OF THE PROGRAMS ARE YOURS FOR FREE! Yes, mail me the 6 CD Set, Handbook and practice exercises from Nightingale-Conant’s program with Asara, The One Command: Imprint Your DNA for Lasting Wealth and Happiness that educates, inspires and transforms your life now. 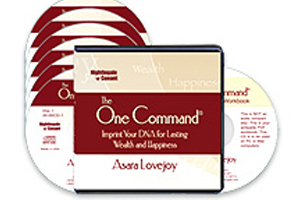 The premier Asara Lovejoy One Command Program Makes Your Mind Give Up Its SECRETS! Release the answers, solutions, and life-changing breakthroughs locked in your theta mind, and programs them into every cell of your being … with JUST ONE COMMAND. Asara Lovejoy says, “What you dream of becoming, you already are. What you want and need, you already have. Here you learn to Release the answers, solutions, and life-changing breakthroughs locked in your theta mind, and program them into every cell of your being … with JUST ONE COMMAND! Yes, I want 5 hours online Personal and Business Success audio/video program with Handbook and exercises to open the doors to immediate and lasting increase in my success! You are directed for real results in your daily life. Many thousands of happy “theta thinkers” have discovered success beyond their imagination; increased revenue, personal achievement and successful business teams. Each one who applied the theta state process realized the only thing holding them back was their limited idea and fear about what they could or couldn’t do. By Commanding for new results each one rose to new heights – and so can you!